Picture having an extra supervisor watching over your employees? shoulders monitoring and controlling the formulation process. What effect would that have on your product consistency and production efficiency? In today’s competitive marketplace, reducing production costs is a sure path to greater profits. Doran’s Formula Control has been guiding production plants along that path with ingredient savings of at least 1.8% - even more. Combine lower ingredient costs with the elimination of the money wasted on bad batches and you can understand why successful companies are investing in the FC6300 Formula Control System. Take a look at the savings one company experienced with the FC6300. This plant realized that improving the performance of their formula scaling could lead to a significant impact on profitability. Additionally, they were averaging one bad batch a week due to errors that were traced back to the scaling process. They turned to Doran Scales to provide the solution to reduce costs from wasted ingredients and bad batches - that solution was the FC6300 Formula Control System. Return on investment due to ingredient cost savings was achieved in just four months and the net one year effect on profit margin was $27,068.71. It’s no wonder that plant managers at this company’s other location suddenly became interested in the FC6300 Formula Control System. Reduction of ingredient costs is easy to see, but the costs associated with bad batches are often overlooked. Like a dripping faucet, those bad batches can drain your plant’s profits a little at a time. Production downtime to clean production lines, discard the bad batch, along with cost of wasted ingredients can add up. Our field studies show that bad batches cost a company $837 per incident. With guaranteed consistent batches, your plant will run more efficiently - adding to your profitably. By prompting the user through the formula, the correct ingredients are accurately scaled every time. Each ingredient of the formula is weighed within a tolerance that you define. 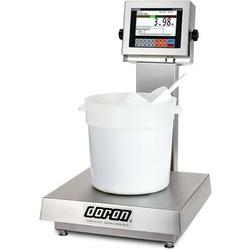 The color-coded Accu-Track display on the bright LCD screen ensures ingredients being added are within those tolerances. Each step of the formula is clearly labeled with batch ID, batch name, the step number, ingredient name, target weight and actual weight. Accurate scaling can be achieved with or without experienced production employees. Formula Loader is a standard component of the FC6300 Formula Control system. 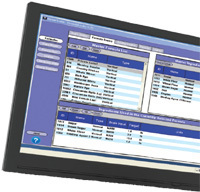 This Windows compatible software is used to configure formulas as well as to provide production reports. Standard Formula Loader reports can be used to evaluate scale operator efficiency and ingredient usage. 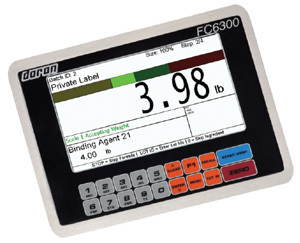 Using scale operator ID’s, the FC6300 tracks when a user logs in and out of the scale. Management can easily determine how long the scale operators are taking to prepare each formula and how accurately it was done. It’s like having the plant manager watching over your employees? shoulders 24/7.